It ain’t always pretty; but boxing has a primal quality, which whether you like it or not, makes it one of the ‘pure’ sports. There are sports with complex rules and sports with fancy equipment. And then there are sports which have been there ever since there have been people – who can run fastest, throw farthest or batter their opponent to submission before being battered themselves. I’m no pugilist, but sometimes you have to fight for what you believe in. And in my line of business, words are sometimes punches. 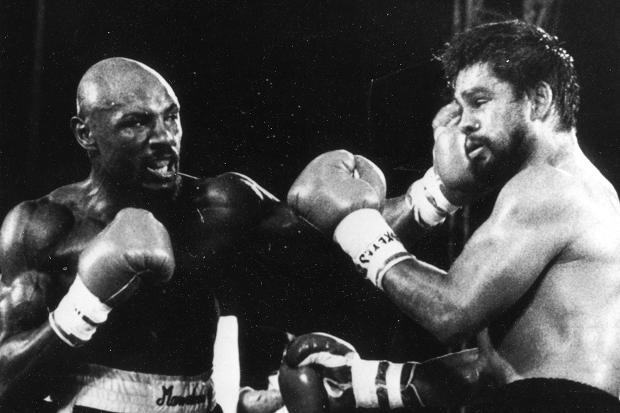 So after an important bout this week, I reflected to a good friend it had been like Hagler vs Durán. For me Marvellous Marvin is pound for pound the best fighter I have seen. Less brutal than Tyson, not the showman that was Sugar Ray and I’m too young to have seen really Ali in his pomp. But when I watched Sportsnight as a kid, the precision, focus, efficiency and relentlessness of Hagler made him the best I saw. Because he wasn’t a heavyweight he didn’t always get the profile. As a taciturn guy with a shaven head he didn’t always please the cameras. And because he didn’t dance around he wasn’t much feted. But as I fighter you wouldn’t want facing you, for me, he stood out. Always going forward, never dominated, quick, precise, focused and hard as nails. As I often joke when people try to get me wound up ‘I’m a lover, not a fighter’. But if I have to fight Hagler is the model – not a big man, no frills, no showboating, just a precise, focused, bald head, hitting you hard; bang bang bang.